Meg Lanning hits out on her way to an unbeaten 35. 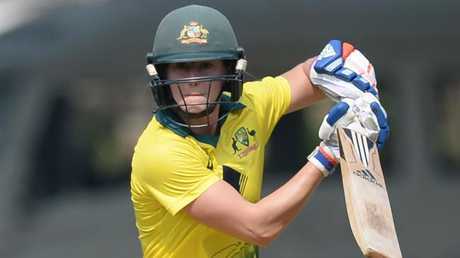 AUSTRALIA have claimed a six-wicket win against India in the opening match of the women's Twenty20 tri-series in Mumbai. Chasing India's 5-152, Australia lost opener Alyssa Healy (4) early but a quickfire 15 from Ashleigh Gardner put them back on track. Fellow opener Beth Mooney (45) and Elyse Villani (39) combined for an 80-run stand before both fell to the experienced Jhulan Goswami (3-30). Requiring a run a ball, captain Meg Lanning (35no) and Rachael Haynes (12no) took Australia home with 11 balls to spare. After losing the toss, India made a strong start reaching 72 before Gardner (2-22) removed Mithali Raj (18) and the dangerous Smriti Mandhana (67). 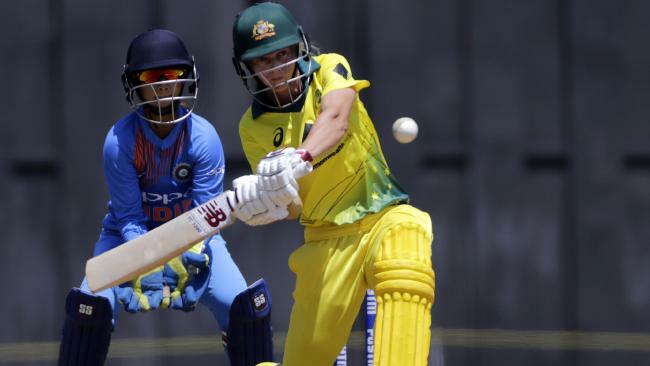 Ellyse Perry was again impressive..
Australia managed to stem the flow of runs with Ellyse Perry (2-31) picking up two middle-order wickets, but a late 21-ball 35 to Anuja Patil was enough to push India's total past the 150-mark. Lanning said it was a pretty good performance by Australia. "I thought we were under the pump a little bit with the ball early. Mandhana was taking it to us a fair bit those couple of wickets in the middle changed the game," she said. "We were pretty happy chasing 150. We thought par was a little bit more than that and our batters did a good job as well." All-rounder Sophie Molineux had a day to remember on debut, the youngster claiming three catches. She said it was a dream come true to make her Australian debut. "It was pretty special. 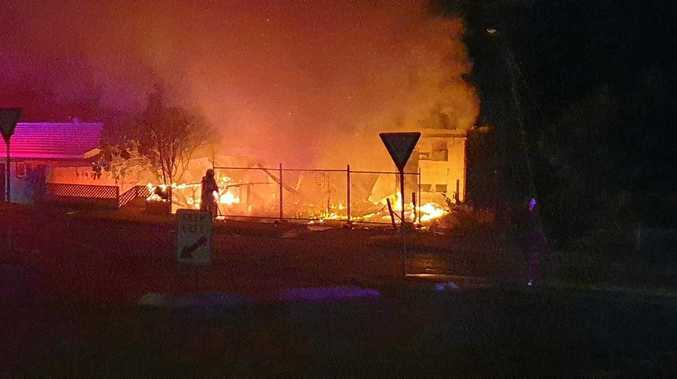 I actually got a tear in my eye which was quite nice," she said. "Obviously a dream of mine and to be here in India and to have my cap presented ... was a really special moment and I'll remember it really fondly." Australia have little time to celebrate. Their next match is on Friday against England, also in Mumbai.